This 2 1/2 mm thick aluminum, four-section pasta cooker combo cooks and reheats pasta quickly with the ability to cook large batches or individual portions. The convenience of the inset pans / straining baskets allows you to pull out separate, individual batches of pasta without draining the boiling water for each batch. Cook pasta easily for a made to order pasta station, or cook large amounts of pasta to prepare for catered events with this cooker! It includes a 20 qt. aluminum pot and 4 insets with handles that make removing and draining freshly cooked pasta easy. My chef asked for a pasta cooker that was way higher priced than this. I ended up buying this one partly because I'm cheap but also because technically it does the same thing. Sure enough, he is very happy with this one and it does everything we need. The other pot he wanted was heavier material, but when it is to be filled with water, the heavier material doesn't do anything other than maybe last 30 years instead of the 15 years this one will last. This is an excellent cooking pan. They are very sturdy and durable. The handles have a soft grip that prevent slipping or dropping. Easy to clean and store. I highly recommend this product. As an italian restaurant, this is our work horse. Can make 4 pastas at once quickly and easily. Easy to clean and handy included strainers are a great value! Absolutely indispensable tool if you do moderate amounts of pasta at your restaurant or food truck but don't want to or cant invest in an expensive pasta cooker/re-thermalizer. Great deal compared to more expensive, similar items, and it gets the job done as advertised. The pasta pot is great but the strainers leave a lot to be desired. The coating on the handles melted on the first use on the stove and had to be removed with scissors. Thank you for your feedback! We are sorry your Pasta Cooker Combo was defective. Corrective action has been taken and a Customer Solutions Representative has credited your account. This pasta cooker works perfectly cooking four at a time. very convenient and is very sturdy. Has everything you need to cook pasta for the family. This pasta cooker combo is awesome! It makes cooking pasta so much easier! It is durable and easy to clean. I would definitely recommend this product! Works as a Seafood Cooker as well. Very versatile pot. We cook our gumbo in one as well. The rubber on the handles makes use so much easier. Simple yet functional. Great price as well. The Pasta Cooker Combo is well made and heavy weight. It is easy to clean and it heats evenly. It saves on time and the price is great. I would recommend this. Perfect pasta cooker combo. The large pot allows for cooking multiple pasta at once. The strainers fit securely on the edge of the pot for draining. Overall a great product, one everyone should have if serving pasta! Great Product , We use it a lot and it makes cooking pasta a lot easier and less messy , high quality and the price is really good . this pasta cooker is great for us. We use it to make ramen, egg noodles, and vermicelli. Well we do use it to make pasta as well thou! easy clean process with water running it. This is one of my favorite pots! Perfect for portioning pasta and nice large size but not too tall. 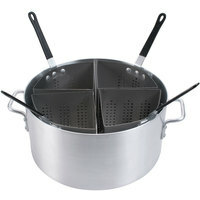 You can clip each strainer on the side and dunk again when ready to heat up and serve. So convenient! Used this the day it arrived. The cooks loved it and it has many uses for many kinds of pasta. The packing was excellent and had zero damage. Not only is this great for cooking different kinds of pasta, it is great for steaming vegetables and for making different kinds of pierogies. I love it that I can make different types of food at the same time in the same pot. It saves on time and money. Would definitely recommend! Quality pot, it's actually quite large, larger than I expected from the pictures. We use this for our stir fry dishes and it allows us to heat multiple ingredients at the same time, for various yaki soba noodle dishes. We love this pot. It's an essential for making pastas in our very busy kitchen. We use it often and have not had any issues with warping. Good quality in deed. Great price for this product. i looked at several others that were twice the price and half as well made. It's sturdy and is holding up well to heavy use. Very pleased! I am sad that our days of cooking multiple pasta dishes are gone and this has been banished to the basement. I loved this little beast. As mentioned in other reviews the handles are a little iffy and if we were going to abuse the thing I would have traded up. But for medium duty it was a great thing to have. Great price for good quality pasta cooker. Shipped out quickly we got it so fast, we like the different inserts for different pasta types. We keep it boiling all day, no problem! This is a must for anyone serving pasta. Just add your pre-cooked pasta to the boiler water for a few seconds and plate it. The 4 separated sections allow you to do multiple at once. It speeds things up. Love the large 20 quart pot and 4 wedges that allows me to cook different pasta at same time. Large order or single serving. It saves time and money. Works great so far. I use it for my pierogi night to help keep orders of different flavors separate. Had to make some small tweaks to the brackets that hold the pots out of the water but really no big deal. So far so good! This is a nice pasta cooker. It works well for warming frozen vegetables or for steaming fresh veggies as well as cooking or warming pasta. Great pot for heating up pasta; however, the handles melt easy and they get hot. This would be a 5 star product if the handles were made a little better. This Pasta Cooker is absolutely a must if you are cooking more than one type of pasta or a large amount. I also use this for blanching different vegetables at the same time. It helps keep it separate. HIGHLY RECOMMEND The pasta Cooker combo is a great asset to our food truck, allows us to cook up 4 different homemade pastas at a time. This is a good pasta cooker and par cooking pot. We use it to blanch leafy greens and vegetables, and then pasta during service. Holds up Well. Our cooks love this pasta pot it is durable we bought one for our other stores and it is still in great condition. Great value and great item. i love to be able to cook a variety of my hand made pasta at one time for my picky family this is a must have. We've never had a problem with this one even though it's half the price of a name brand. An essential gadget in high-volume pasta/noodle station. Great for steaming and blanching as well. The rubber on the handles melts off in a short period of time and it is not very durable. On the other hand it is great for heating multiple pasta orders in the same pot. Thank you for reviewing this product! If you're looking for a more durable set, we recommend the Vollrath 68127 Wear Ever vegetable and pasta cooker set. Pasta pot holds up well. The inserts seem to be a little fragile. Maybe I should go easier on them but they only have small tack welds on them so the bottom piece inside the insert fell out on 2 of them.. Easy fix but would prefer not have to do it. Thank you for reviewing this product! We are sorry that you have experienced issues with this item. A Customer Solutions representative will be in contact with you. I was totally surprised when I recieved this , It is a great quality pan .It is a great way to have pasta ready at any time! Great for steaming shrimp and other foods where we need to keep spices and seasonings off the cust plate. simply put the seasons in one of the containers and boil with the rest! again, webstaurant never disappointed me. they always have good quality stuff for incredible price. we have been using this cooker everyday for one and half years, no problem at all. We use this for dunking and refreshing pasta. The major drawback is in each of the "quarter" bins. They have some sharp edges and I occasionally cut myself while washing. Nothing that a bit of caution wouldn't get around. This Pasta Cooker is a very affordable way to cook pasta to order. It allows me to cook 12 pounds of pasta from scratch in 1 hour. It's the staple in my pasta kitchen. It's great and easy to keep clean.